In the nature, there is a kind of plant called Codariocalyx motorius that can dance with music. In my design, I tried to develop a kind of canopy that can dance with surrounding music, which can be placed in the public square, plaza or shopping mall. . The canopy has three parts: trunk, branches, leaves. The trunk can twist by the density of wind to smooth, because in the reality, trees act as a role of wind suppressor. 1. It can dance with background music that mainly performs in the evening. 2. The leaves can change the angel to smooth the sunshine in the daytime. 3. Also, the leaves can vibrate when there is a breeze sway. 4. The trunk and branches can twist when the general wind speed is high. I transfered the system sound into frequency, tone, and volume. 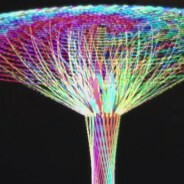 Then I filtered the frequency into color channel, the volume into lightness channel, and the tone into rotation channel. 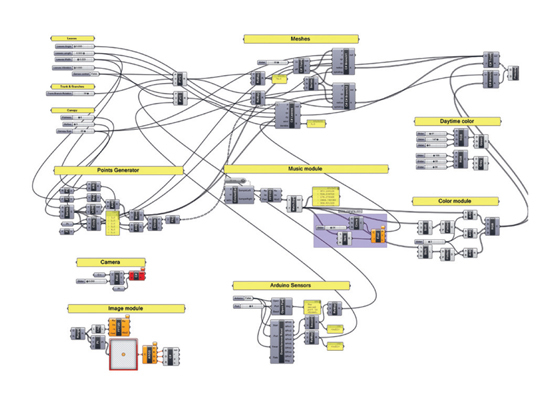 Therefore I can visualize the music in the Rhino with these three control values. In the parametrical design, the size, height and hollow of the canopy is changeable. In the further research, it could be changing the color by the environment color. The leaves could be getting bigger and smaller by season. This kind of bionic design can give people the feeling of being in the nature. It can “take care” of people taking a rest under it. 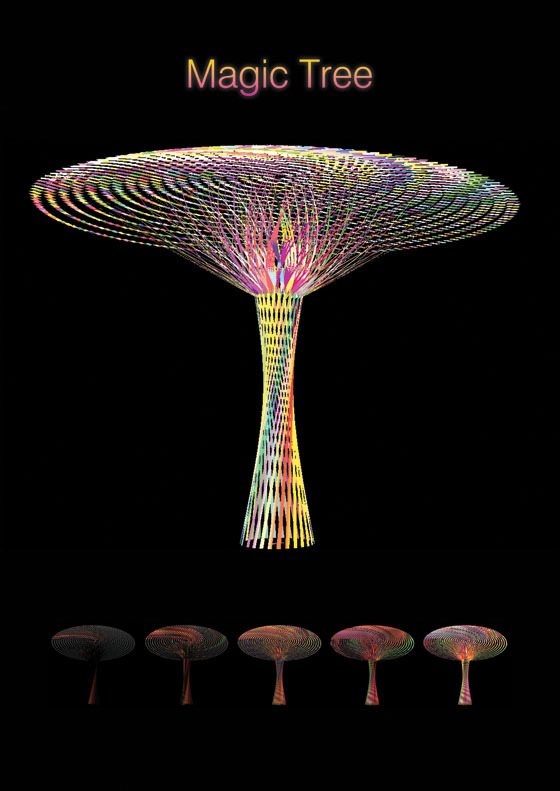 This bionic canopy can interact with surrounding music and have many parameters to change the shape by surrounding stimulation.